The scale of the suffering prompted by the cyclone in Burma is huge. Only a massive outside relief effort can help the authorities there to cope with the catastrophe. But Burma's isolated military regime has been dragging its feet in accepting offers of aid - something that has frustrated non-governmental organisations and many other governments alike. Their frustration has been exemplified by the French Foreign Minister Bernard Kouchner - himself a veteran humanitarian activist - who proposed the idea that there should be a UN resolution compelling Burma to accept outside aid. Such a move was strongly opposed by Russia and China, who are uneasy about the implications of such a step, which they see as intruding into Burma's internal affairs. Mr Kouchner's call was based upon an idea that has gained some ground in international affairs during the past decade. This is the notion that the international community has a right, indeed a duty, to intervene in another country's affairs, if it is not upholding its responsibilities to its own citizens. The doctrine, first championed by the Canadians and recognised by the United Nations in 2005, is known as "the responsibility to protect". It was strongly influenced by the experience in the Balkans, and Nato's military intervention to expel Serbian forces from Kosovo in 1999. The Serbian authorities, it was argued, were conducting genocidal attacks against a part of their own population. Taking military action, though, is one thing - forcing a country to accept a vast humanitarian aid effort quite another. Ed Luck, a special adviser to the UN Secretary General, has argued that linking the "responsibility to protect" to the situation in Burma is a misapplication of the doctrine. The World Summit in 2005, he says, saw this responsibility being applied in four very specific cases - genocide, war crimes, crimes against humanity, and ethnic cleansing. The US and France still seem to be hinting at the possibility of some kind of forced delivery of aid if all else fails, and the Burmese government continues to refuse to grant humanitarian access. But quite apart from the political implications of such a step, there would be huge practical problems, too. Such an approach might have to rely upon air-drops of food and emergency supplies to the flood-hit areas. Without proper co-ordination on the ground this might be a gesture, at best. There can be no substitute for a vast, co-ordinated operation on the ground. Inevitably, then, the focus remains on applying diplomatic pressure to encourage Burma's rulers to relax their constraints. 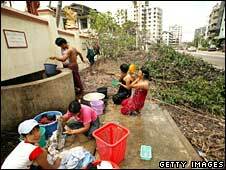 Britain is pursuing urgent efforts with both the Burmese authorities, and countries with close ties to the military regime there - like China, India and Thailand - to try to deal with the central problem slowing the aid effort to the cyclone-stricken region: access. Britain's ambassador in Rangoon, Mark Canning, in a telephone briefing, said that some aid workers were being allowed into the country, but not on a scale that was either large enough or fast enough. He said that governments with close ties to the Burmese authorities had a very important role to play in trying to convince them to allow a major international aid effort to get under way. Burma experts, though, stress the scale of the problem. This, they say, is an inward-looking regime, where every effort has been made to limit access to the country from outside. The British ambassador's message to the Burmese authorities was clear - steps had to be taken to get the badly-needed experts in as quickly as possible.